"AASHTO - AASHTO Technology Implementation Group - Self Propelled Modular Transporters." AASHTO - AASHTO Technology Implementation Group - TIG Home. AASHTO. Web. 26 May 2010. <http://tig.transportation.org/?siteid=57&pageid=2478>. Acrow Corporation. ACROW 700XS Panel Bridge Technical Handbook. Rep. Third ed. ACROW, 2009. Print. A New Orthotropic Deck for Multiple Longitudinal Girder Bridges: A Structal-Bridges Innovation. Web. "About SSSBA." Short Span Steel Bridge Alliance. Web. 13 May 2010. Big R Bridge. Super - Cor. Greely, Colorado: Big R Bridge, 2008. Big R Bridge. Big R Bridge, June 2008. Web. 22 June 2010. <http://www.bigrmfg.com/assets/pdf/BigR_SuperCor_2008.pdf>. Alliance. Web. 13 May 2010. <http://www.aisc.org/WorkArea/showcontent.aspx?id=20232>. Clemens, David. "Fwd: Short Span Modular Steel Bridge Concepts." Message to Karl E. Barth. 1 June 2010. E-mail. Transportation Federal Highway Administration, 2007. Print. Metal Products Co., Ltd. Web. 25 May 2010. <http://www.ns-kenzai.co.jp/english/042civil_engineering.html>. Big R Bridge Homepage. Big R Bridge. Web. 13 May 2010. <http://www.bigrmfg.com/>. Guidelines for Geosynthetically Confined Soil. Web. 13 May 2010. <http://www.gcswall.com/upload/A%20new%20approach%20to%20a%20GCS%20design%20guideline.pdf>. Geosynthetically Confined Soil Website. Web. 11 May 2010. <http://www.gcswall.com/>. Greenwald, Jeffrey H. "Comments on Short Span Paper." Message to Karl E. Barth. 2 June 2010. E- mail. I-95 Bridgeport, CT. Digital image. Acrow Bridges. Web. 18 May 2010. Inverset Section Being Placed. Digital image. Amcrete Products. Web. 10 May 2010. Performance Steel Bridge Concepts. Rep. American Iron and Steel Institute, 1996. Print. Kozy, Brian, Ronnie Medlock, and Derek Mitch. Orthotropic Deck Girder Bridges for a Rapid and Long Lasting Solution. Rep. Print. Free Vibration Response. Rep. Vol. 59. ELSEVIER, 2003. Print. Journal of Constructional Steel Research. McGough, Michael. Proposed Research Project for Flexible Metal Culverts. Rep. Print. Mechanically Stabilized Earth Wall Abutment. Digital image. Bridge Abutments. Big R Bridge. Web. Institute, 2001. Web. 14 June 2010. <http://www.steel.org/AM/Template.cfm?Section=PDFs1&CONTENTID=9157&TEMPLATE=/CM/ContentDisplay.cfm>. Modern Steel Construction. "National Award Box Elder Creek Bridge." Modern Steel Construction Nov. 2007. Web. 22 June 2010. <http://www.steel.org/bridges/AIB_BoxElderCreekCaseStudyReprint.pdf>. National Corrugated Steel Pipe Association. "Chapter 2: Product Details and Fabrication." Corrugated Steel Pipe Design Manual. National Corrugated Steel Pipe Association, 2008. 23-129. Print. The Neel Company. Southard St Bridge Replacement. Digital image. T-WALL Retaining Wall System. The Neel Company. Web. 22 June 2010. <http://www.neelco.com/gallery.php4?a=Bridges&i=TW2642_CD81_03.jpg>. North American Steel Sheet Piling Association. "Roadway Embankments Using Steel Sheet Piling - NASSPA." North American Steel Sheet Piling Association - Promoting Hot-rolled Steel Sheet Piling. Web. 22 June 2010. <http://www.nasspa.com/roadway-embankments.php>. North American Steel Sheet Piling Association. "Steel Sheet Piling Used in Bridge Abutments - NASSPA." North American Steel Sheet Piling Association - Promoting Hot-rolled Steel Sheet Piling. Web. 22 June 2010. <http://www.nasspa.com/bridge-abutments-1.php>. Open Grid Deck. Digital image. Web. 11 May 2010. Peterson, Kris, and Mary Lou Ralls. Accelerated Bridge Construction (ABC) and the Utah Experience. Precast Concrete Pile. Digital image. Web. 11 May 2010. Reeves, Will. Modular Piers. Rep. 2009. Print. Roy, Sougata, and Yeun Chul Park. "Fatigue Evaluation and Enhancement of a Modular Steel Orthotropic Deck." The 27th Annual International Bridge Conference. David L. Lawrence Convention Center, Pittsburgh. 8 June 2010. Lecture. SDR Engineering Consultants, Inc. Prefabricated Steel Bridge Systems. Rep. no. DTFH61-03-R-00113. Washington, DC: Federal Highway Administration, 2005. Print. Sheet Piling Bridge Abutments, Robert J. Carle, Scott S. Whitaker, DFI Proceedings 14th Annual Conference, 1989, Baltimore, MD. of a Dead Load Simple Live Load Continuous Weathering Steel Girder Bridge in New Mexico. New Mexico Department of Transportation. Web. 11 May 2010. <http://www.aisc.org/assets/0/1209478/1209480/1236512/483d552c-fabe-49a9-8d39-b32ef3f0d69a.pdf>. American Institute of Steel Construction. Web. 13 May 2010. <http://www.shortspansteelbridges.org/pdf/MythsAndRealitiesOfSteelBridges.pdf>. Steel Has the Solution. Digital image. Short Span Steel Bridge Alliance. Web. 10 May 2010. Steel Truss Bridge. Digital image. Vehicular Truss. U.S. Bridge. Web. 13 May 2010. SuperSill Abutment. SuperSill Abutment System. Web. 10 May 2010. Connection System. Web. 15 June 2010. <http://www.jjhooks.com/traffic.shtml>. Transportation Research Board. "Accelerating Bridge Construction - Seismic Connections." Lecture. Transportation Research Board. Transportation Research Board. Web. 25 June 2010. <http://www.wsdot.wa.gov/eesc/bridge/ABC/TRB_Research_Proposal_Webinar.pdf>. Transportation Research Board of the National Academies. "Installing a Bridge Superstructure on a Weekend." TR News Mar.-Apr. 2010: 17. Print. Trinity Highway Products. Trinity Highway Products. Trinity Highway Products, 2008,. Print. Virginia's Superstructure Replacement of I-95 James River Bridge. Digital image. Highways for Life. U.S. Department of Transportation Federal Highway Administration. Web. 13 May 2010. <http://www.fhwa.dot.gov/hfl/ralls.cfm>. Wipf, Terry J., F. Wayne Klaiber, Holly A. Boomsma, and Kristine S. Palmer. Field Testing of Railroad Flatcar Bridges Volume I: Single Spans. Rep. no. TR-498. Iowa Department of Transportation, 2007. Print. Wright, William. 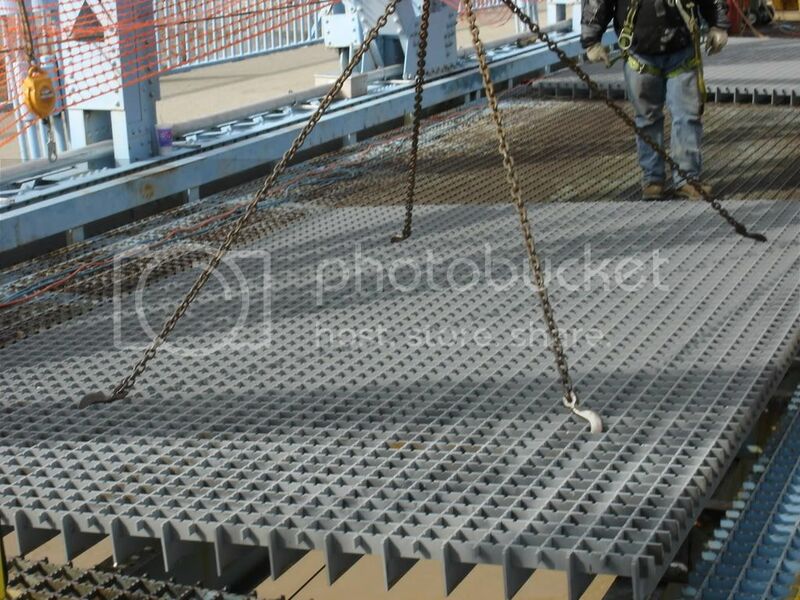 Sandwich Panel Modular Steel Bridge Deck System. Rep. Virginia Tech, 2010. Print.